This book was a massive help in planning the Ultralight Summit in Slovenia, as it allowed me to make sense of the environment the event was going to take place in. For anyone planning a trip to Slovenia’s Julian Alps, I’d say that this book is required reading. For everyone else it’s a great inspiration to go and visit the Julian Alps. A book review. The Julian Alps of Slovenia by Justi Carey and Roy Clark ain’t light at 300+ pages [actually it is 405 gram heavy] but it is full of useful information on Slovenia and the different trails in the Julian Alps, hence is almost a mandatory tool in planning a trip to the area. It starts like most Guidebooks with an introduction to country and people. While I enjoyed the presentations of Slovenian classmates back in University (they’re fabulous ambassadors of their country and very proud of it - rightfully so!) it has been a while, and so I read the first forty something pages of introduction with attention. The usual fare of history, people, culture is interlaced with information on the Triglav National Park, Mountain Rescue, Waymarking, Navigation and more. 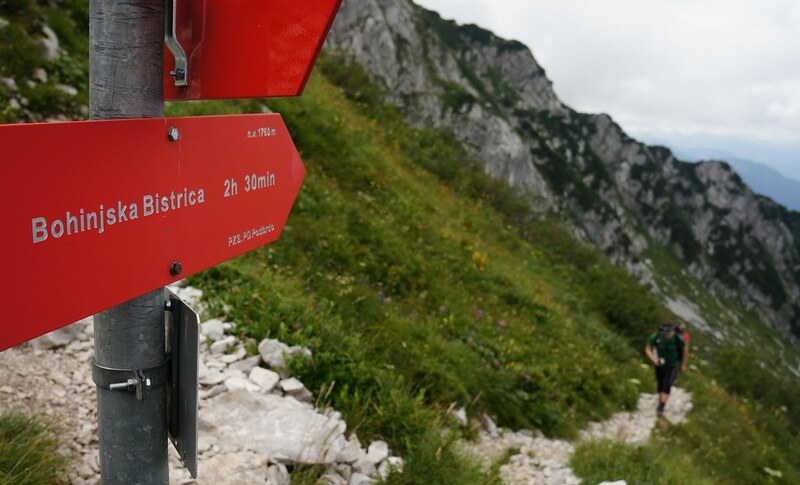 After you know your way around in Slovenia, you get to the most interesting part for every hiker: Trail descriptions! Routes, all sixty one of them, start with a small info box with all the useful information: Distance of the route, estimated time, the grade, meters of ascent, how to get there, maps needed and where one can sleep. This is followed by a second box with a general overview of the route, which gives a bit of background information. Then the really juicy bits start: A fairly detailed description of the route, as well as points of interest. The authors take you by the hand and walk you up the route, and back down, show you where to look for a good view and wildflowers, and where you can get water and a meal. You get the most out of this description if you have a detailed map lying next to you [more on maps shortly] so that you can follow the trail, look at the contour lines and see where you’re planning to walk. Combining routes is easy, as they are sorted by areas, and usually two or more routes are shown on the illustrative maps; for example you could without much trouble combine Route 26 and 27 for a two day hike. Though for those don’t want to take part in such difficult mental exercises, the authors have included four multi-day treks. Puh. At the end of the book a few Appendixes give you a bit of extra information, of which the glossary is a very useful one. A shortcoming of the book is in my opinion that it sticks to the Slovenian manner of measuring distance in time. I’m not a slow hiker, but I found the Slovenian times misleading, both for ascent and descent. As a rule I add 15 minutes on top of each hour suggested in the book and the signs, which is for my speed more accurate. Overall I would have preferred that distances are given in kilometres instead of hours, so one can calculate more accurately on how long a certain section would take. Overall this is just a minor complaint, and once realised can easily be adjusted by adding time to the estimates. Photos are a big part of this book, and inspiring they are. Almost every double page has a photo or two, and the two authors certainly did a fabulous job at capturing great scenes and panoramas which wet the appetite of the reader. It makes you dream, and shows beautiful highlights of the walks described in the book. The maps are not very detailed but good enough to plan and illustrate the trail. 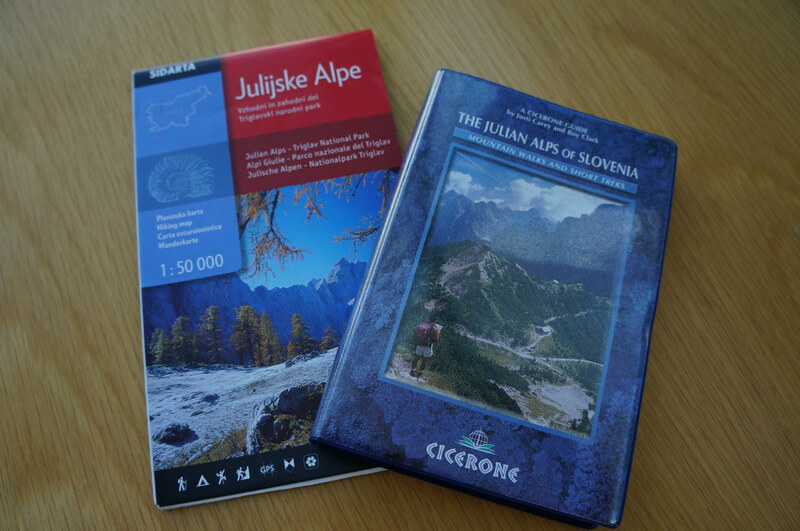 For proper, safe navigation in the mountains a real map [and a compass, as well as the knowledge on how to use them] is indispensable and that’s why you should get the above shown Julijske Alpe map or a Triglav Map at the same time that you buy the book. It’s hard to source maps outside of Slovenia, though once there you can pick one up at most info centres for around 9€. All in all a fabulous book which is very inspiring and will have you want to go to the Julian Alps. It has all necessary information with good details [or Insider Information], very detailed route descriptions, and great photos to get you motivated for your trip. I still am going through the book, looking at new routes and how to combine some of them int multi-day hikes - because the Julian Alps are a fabulous destination for hikers & backpackers!